Paddling gracefully and silently below the majestic craggy cliffs of the Gazzle peninsula will seem like something out of a nature documentary, as the local marine life go about their business undisturbed by your presence with no engine this stealthy ocean craft offers mobile viewing platform like no other. What is the Eco Super SUP Tour? There really isn’t a better way to explore Cornwall’s ecologically rich coastline than on a large inflatable stand up paddleboard! Don’t forget your waterproof camera, inquisitive grey seals and dolphins will, on occasion get up close and personal to our giant Eco Super Stand Up Paddle Board. You’ll also paddle past protected coves and secluded caves that provide the perfect habitat for a wealth of native flora, fauna, wildlife, birdlife and sea life. With such an abundance to see and discover, our unique Eco Super Stand Up Paddleboard Tour is ideal for a group of nature loving friends, a school trip, scout & guide outing or anyone looking for a something a little different this summer. One of our knowledgeable guides will provide you and a group of fellow nature enthusiasts with a top of the range wetsuit, buoyancy aid, helmet and pro paddle. We’ll lead you through beach safety and fundamental paddle techniques before launching the Eco Super Stand Up Paddle Board from Newquay Bay. We’ll then guide you along Newquay’s beautiful coastline, abundant in marine, bird and wild life. Our guides are passionate about our coast and trained to teach you all about our local ecosystems. This is the ultimate way to enjoy our coastline! In addition to becoming an apprentice marine biologist you’ll also get the opportunity to have some fun on the open seas, playing a host of games that will up-skill your technique in preparation for the tour. The Eco Super SUP experience offers an unbeatable balance of education, fun, learning and just the right amount of adrenaline. Our reviews on Trip Advisor rank Newquay Activity Centre as number one for Cornwall activities and we’re proud golden winners of the Cornish Tourism awards. 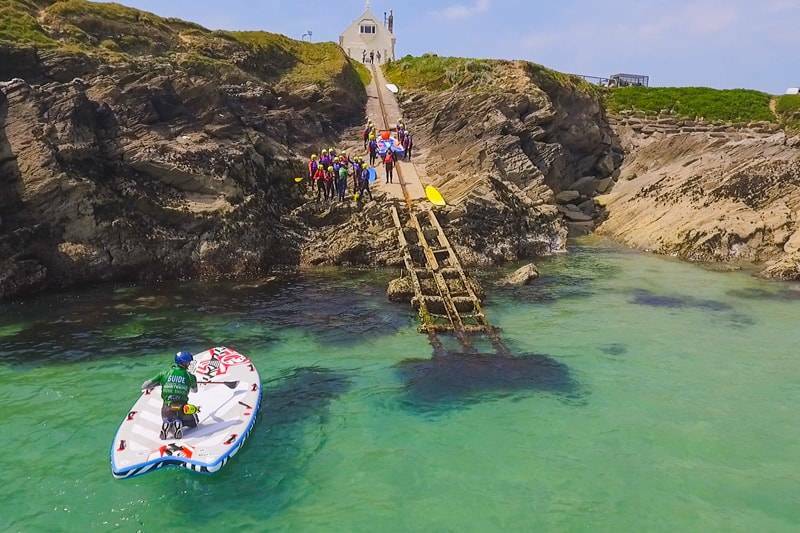 Our Super SUP activities are unique to Newquay Activity Centre and will be an adventure to remember!